David is cooking with his Mother at home on a dull day. A Witch flys overhead and smells the baking. She loves the smell and lands in the cherry tree and tries to get one of the cakes, but David sees her and foyles her attempts until he gives her the burnt cakes which she loves.Too long for storytimes but interesting grammer and vocabulary.Pictures are really dated, especially of the Mother; flares and mullet hair style. This had a nice fancifulness to it that I wouldn't have expected. I liked the fact that it featured a boy helping his mother cook rather than the more stereotypical plot it could have had.I enjoyed the fact that the witch seemed real to the boy, but nearly imaginary to the mother, but she humored her son. I also know what to do with burned cakes now! An early Mahy classic. 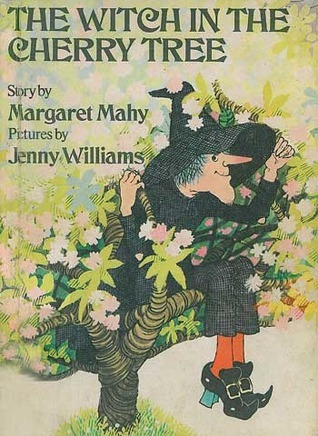 I love the relationship between David and his mother, and how they caution each other against the ploys of the hungry witch.Mahy's words are as deeply satisfying as freshly-baked cakes and Jenny Williams' illustrations are a perfect complement to them. David is making cakes with his mother one day and his batch is burnt! He throws them onto the lawn where the witch waits in the cherry tree. She dives down and eats the burnt-black cakes enjoying every bite of the so called "Witch Cakes"